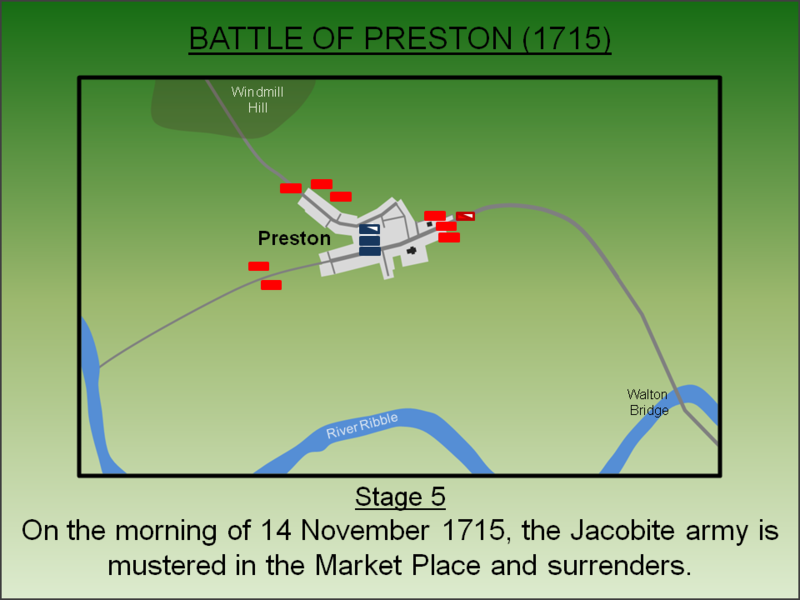 At the Battle of Preston (1715), an Anglo-Scottish Jacobite army was engaged by Government forces. Fought within the confines of the town itself, the Jacobites mounted a spirited defence successfully repelling the first assaults on their lines. However, as more Government troops arrived they had little choice but to surrender. The mid-seventeenth century had seen the British Isles engulfed in a series of internal conflicts now labelled as the Wars of Three Kingdoms. The turbulence seemingly ended with the restoration of Charles II in 1660 but, whilst both England and Scotland were now war weary, key constitutional and religious issues had not been resolved. When Charles II died in 1685 he was followed by his overtly Catholic brother, James II (VII of Scotland), causing alarm amongst the Protestant English gentry. Nevertheless at the time of his coronation James had no male heirs and his only two children - Mary and Anne - were both married to Protestant husbands. However in June 1688 James' wife, Queen Mary, gave birth to a male child, James Francis Edward Stuart. Faced with an enduring Catholic dynasty, a number of senior English magnates invited William, Prince of Orange to invade. He was the nephew of the King and was also married to his eldest daughter, Mary Stuart. William landed with his army on 5 November 1688 at Brixham which started a popular uprising against King James that resulted in his overthrow. Known as the Glorious Revolution, William and his wife became joint monarchs subject to constitutional limitations whilst James II and his family were allowed to escape into exile. The new monarchs were embraced in Protestant England and across much of Scotland but, in some areas of the latter, there was some reluctance to displace the Stuart dynasty which had ruled for over 300 years. This had prompted the first Jacobite rebellion, which started in April 1689 and saw initial success at the Battle of Killiecrankie, but was ultimately defused with a general amnesty. The former James II died in September 1701 but his son, James Stuart, continued his father's claim and sought to be recognised as James III. The British Government styled him as the Pretender (later the Old Pretender) but did see him as a threat especially as the marriage of William III and Mary Stuart had failed to produce any children. Accordingly the Act of Settlement (1701) was passed formally barring Catholics from the throne and thus excluding James Stuart and over 50 other potential heirs. Although William III was followed by Anne, another daughter of James II who was also childless, after her death in August 1714 the Crown passed to the descendants of the Electress Sophia of Hanover (a granddaughter of James I) whose children were all Protestants. Prior to Anne's death an offer to James Stuart, then in exile within the court of Louis XIV, for him to renounce his faith and take the Crown was rejected by the Pretender. Instead the Crown passed to the first of the Hanoverian monarchs, George I.
George I was not particularly popular in either England or Scotland and his coronation was marked by riots in several English towns. 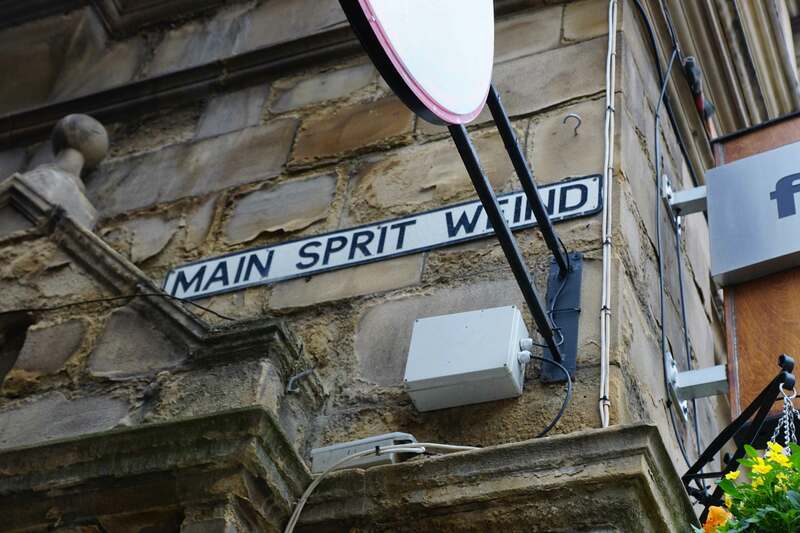 Furthermore the Tories lost power in the General Election in early 1715 and this led to a number of disgruntled individuals seeking opportunities for change. Combined with general discontent in Scotland over the Act of Union (1707), which merged the Governments of the two countries, rebellion was inevitable. It formally started on 6 September 1715 when John Erskine, Earl of Mar proclaimed James Francis Edward Stuart as King. Over the next month the Earl managed to take Inverness, Aberdeen and Dundee. In England the Government moved swiftly to avert a rebellion. Government troops were sent to reinforce ports along the south coast and Oxford was also occupied due to fears it might prove to be a base for an uprising. Furthermore on 2 October 1715 a number of arrests were made including Sir William Wyndham, believed to be the main actor for the Jacobite cause in England. The net effect was there was no Jacobite rebellion in southern England. 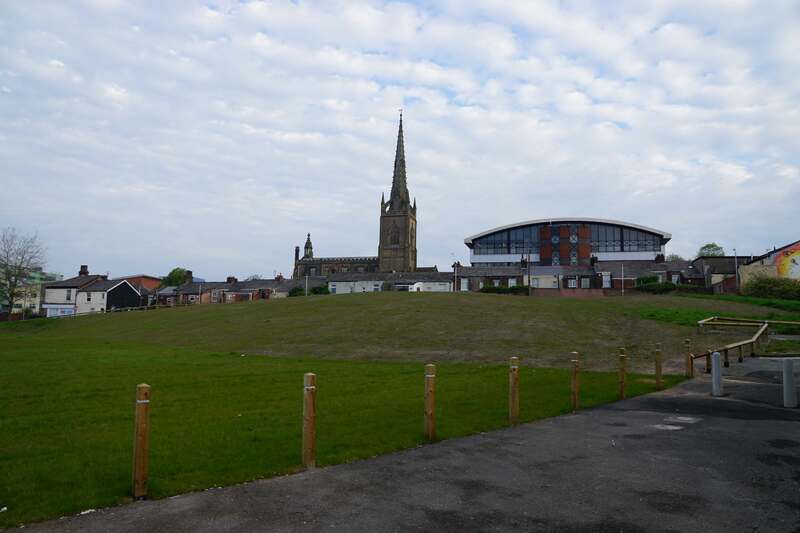 However Mar was aware support for the Stuart cause was strong amongst the pro-Catholic gentry of Northumberland and he cultivated this resulting in a rebellion starting there on 6 October 1715. The leading magnates in this uprising were James Radclyffe, Earl of Derwentwater and his cousin, Sir Thomas Forster MP, but together they mustered little more than a token force. Accordingly Mar detached 2,000 troops under the command of Brigadier William Mackintosh, Laird of Borlum to join with them. Forster, allegedly a bombastic individual but one with little military experience, was chosen as its leader. A Government army in Manchester, under the command of Major General Charles Wills, was ordered to intercept and destroy the rebel army. A further army, under Lieutenant-General George Carpenter was dispatched to Newcastle. Since the start of the Northumberland uprising in October 1715, Forster had kept his forces on the move hoping to recruit more soldiers. He had left Northumberland in late October and attempted to take Newcastle. However, they had found the town too strongly defended and so proceeded north to Kelso to rendezvous with Mackintosh's troops. Thereafter the force proceeded back into England and marched via Penrith, Appleby, Kendal, Kirby-Lonsdale and Lancaster on a recruiting mission. 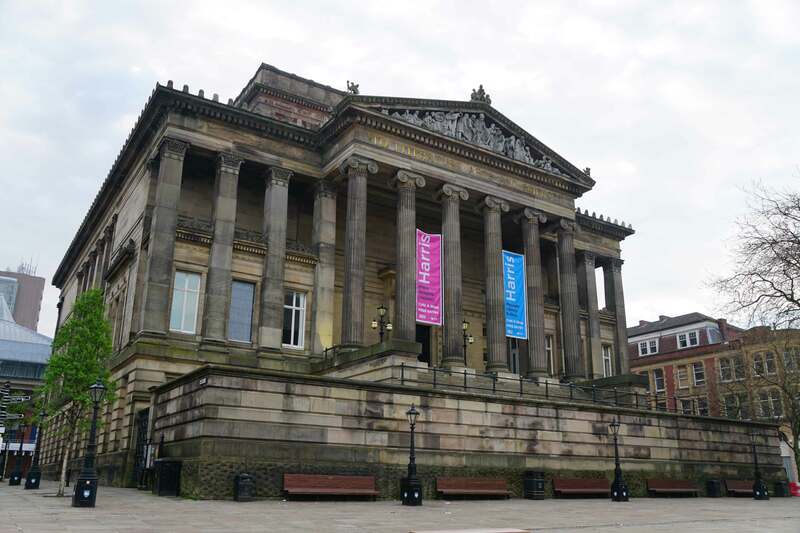 By 10 November 1715, having evaded all contact with Government forces, he was at Preston. Unbeknown to Forster, Wills was hot on his heels having marched out of Manchester and proceeded via Wigan. 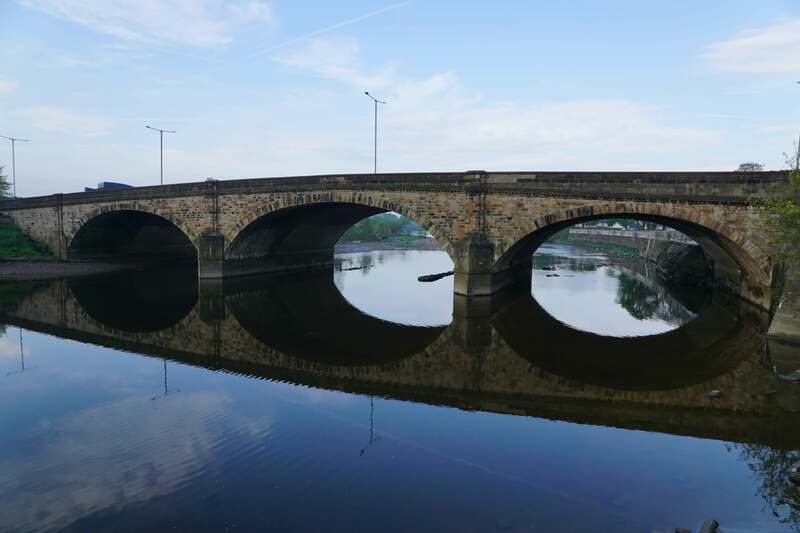 On the morning of 12 November 1715 his troops were at Walton Bridge just one mile from the town. The Government army amounted to around 2,500 men consisting of one Regiment of Cavalry, five of Dragoons (mounted infantry) and one of infantry. The force was also augmented by militia forces (numbering circa-300) that had been mustered in Lancashire. Under the Command of Major General Charles Wills, much of the army had recent military experience from fighting in Ireland, the West Indies and on the continent. On the second day of the battle Wills was relieved by his senior, Lieutenant-General George Carpenter, although the disposition of the forces was not changed. Carpenter also brought another three Regiments of Dragoons (probably accounting for an additional 600 men). 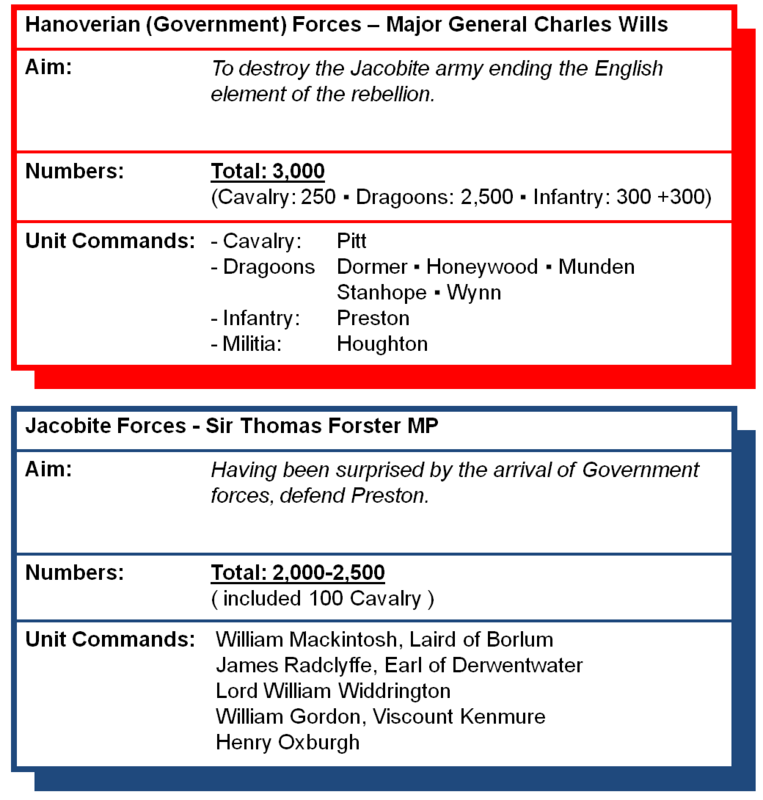 The Jacobite army was under the overall command of Sir Thomas Forster MP and numbered around 2,500 men. Well over half the force was Scottish with the bulk of troops having been sent south by the Earl of Mar and many more having been raised in the Scottish Borders by William Gordon, Viscount Kenmure. The rest of the troops were local recruits who were poorly trained and equipped. The force only had a small cavalry contingent - around 100 strong - and had just six artillery pieces (which had been removed from ships whilst the army had been at Lancaster). The battle was fought between 12 November and 14 November 1715 in the outskirts of the town. 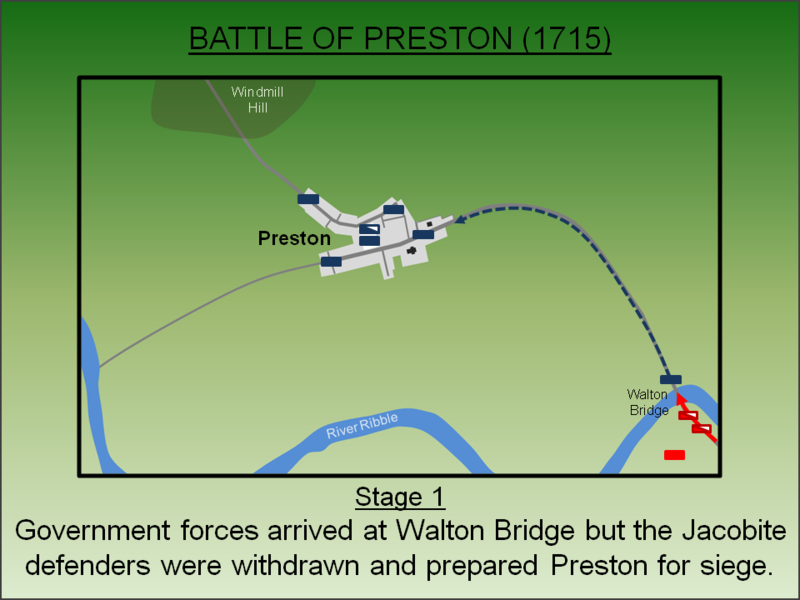 The Government troops arrived at Walton bridge by late morning of 12 November 1715. This was the only bridge over the River Ribble for miles and it had played a key part in the first Battle at Preston (1648). The Jacobites had a small contingent defending the bridge and could easily have bolstered this with more troops. However Forster pulled his men back to Preston as he felt the low water level would have allowed the Government forces to ford the river. Either way the Jacobites now withdrew into the town and prepared for siege. They built barricades across the three main roads into the town as well as the smaller back streets. Trenches were also dug to block access. Forster allegedly panicked and took to his bed providing no leadership to his soldiers for the rest of that day. Wills dismounted his dragoons and, combined with his infantry, decided to launch an attack on the east and north sides of the town. He kept his cavalry in reserve ready to counter any attempt at a breakout. The first Government assault took place around 2pm on 12 November 1715 against the barricade on Church Street. Several hundred Government troops attempted to overrun the barricade but, under the command of Brigadier Mackintosh and aided by the view from the church tower, the Jacobites repelled the attackers. The narrow roads forced the Government troops into tightly packed formations that made them easy targets for the defenders and they suffered heavy losses. The Government forces tried again attempting to penetrate the eastern defences via one of the side lanes but were repulsed by Lord Charles Murray's Regiment. Concurrently Government troops seized two large houses outside the main barricade - one of which was probably Patten House owned by the Earl of Derby - and from the gardens attempted to flank the Jacobite defences. From their observation post in the church tower, a Jacobite force under James Radclyffe counter-attacked and frustrated the attempt. The original intent had been for combined assaults on the Jacobites from the east and north but co-ordination issues within the Government army meant the attacks weren't synchronized. As the Government troops moved round to the north of the town, the Jacobite reserve waited in the market place ready to deploy as required. The attack was eventually made on the barricade barring the main road from Lancaster around sunset (approximately 5pm). Under Colonel Mackintosh the Jacobites fiercely defended their position and once again repulsed the Government troops. As darkness came down, Wills had his men set fire to a number of buildings on the outskirts of the town both to illuminate the battlefield and in an attempt to smoke out the Jacobites. The wind frustrated the latter and no further progress was made that evening. Nevertheless, despite the victory numerous Jacobites, now fully aware of the extent of the forces pitched against them, choose to slip away overnight. The first day of fighting had seen the Jacobites triumph with hundreds of Government troops killed for minimal losses. An uneasy peace settled on the town overnight but, the following day, the situation quickly deteriorated for the defenders. Around 10am on Sunday 13 November 1715 the Government army was reinforced by additional troops under Lieutenant-General Carpenter who had arrived from Newcastle. He used the additional men to implement a complete blockade around Preston - escape for the Jacobites was now impossible. This was not lost on Forster and it was also clear the army had exhausted the bulk of their ammunition from the fighting on the first day. With the Government cavalry commanding the fields outside of the town, breakout was impossible whilst staying and continuing to defend the town was not a long term viable proposition. Accordingly Forster sent Henry Oxburgh to negotiate a truce. If Forster had hoped for honourable terms however, he was to be disappointed. Carpenter made it clear he regarded the Jacobites as traitors and the only term he would offer if they surrendered was they would not be killed immediately and would be sent for trial. Despite the awful terms offered, on the morning of Monday 14 November 1715 the Jacobite army was mustered in the Market Square and surrendered to the Government forces. Over 1,500 men entered into captivity. A total of 45 would later be tried and executed including William Gordon, James Radclyffe and Henry Oxburgh. A further 639 were shipped to the West Indies as slaves. The remainder, including Forster, lingered in gaol until a general pardon was granted in 1717. Government casualties during the battle were recorded as 148 either killed or wounded although the actual figures were probably double that. The Battle of Preston was a decisive victory for the Government that completely ended the English element of the 1715 rebellion but in Scotland the uprising dragged on for longer. The Battle of Sheriffmuir had been fought on the 13 November 1715, concurrently with the action in Preston, but was indecisive. James Stuart himself arrived in Scotland in December but his presence failed to inspire his troops, momentum was lost and by February 1716 he returned to France. The rebellion was defused but two further Jacobite uprisings would follow in 1719 and 1745/6. The latter was the most serious and again involved an invasion of England but this time even fewer English Jacobites supported the cause. - Battle of Sedgemoor (6 July 1685). Accepted by all authors as a traditional, pitched battle. 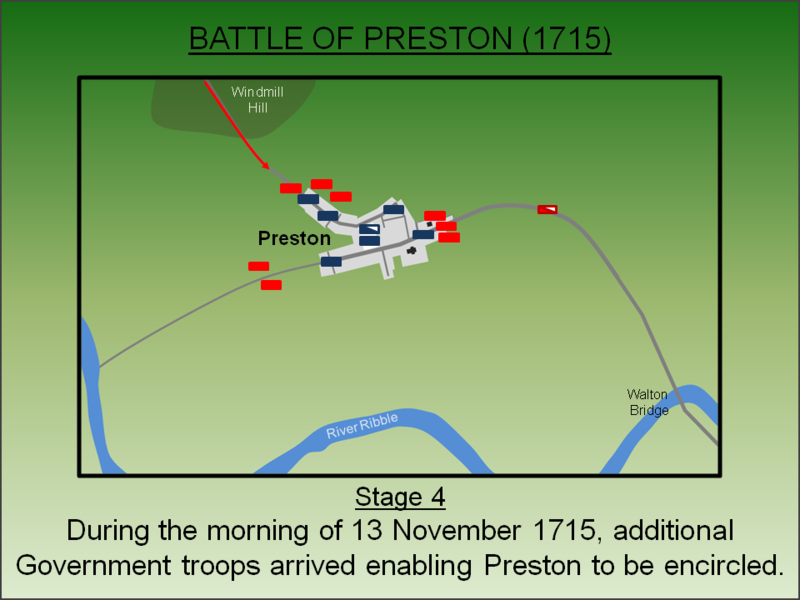 - Battle of Preston (12-14 November 1715). Some authors do not accept this was a battle and instead classify it as a siege. - Battle of Clifton Moor (18 December 1745). This is not described as a battle by most commentators and is often simply seen as a rearguard action to protect the Jacobite army as it withdrew north. Boyer, A (1715). 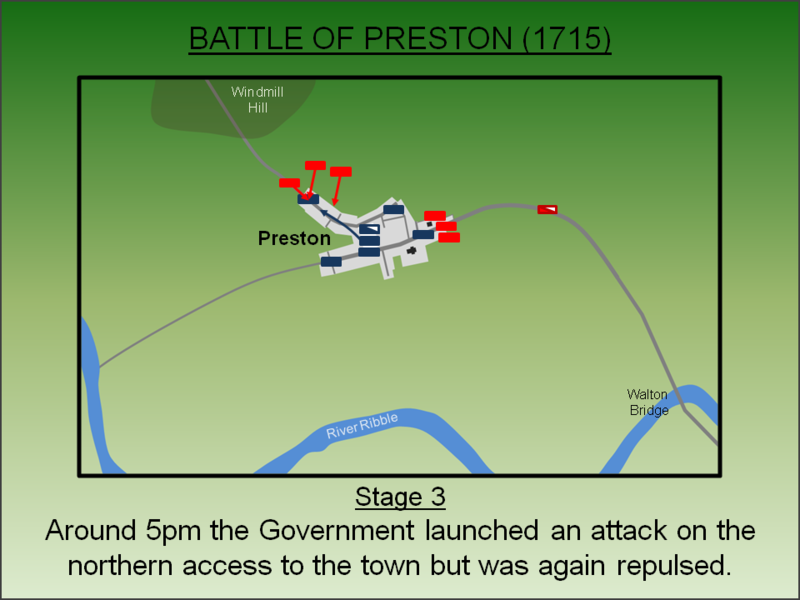 Map of the Battle of Preston, 1715. Chandler, D (1990). The Art of Warfare in the Age of Marlborough. Spelmount, Staplehurst. Hibbert, S (1845). Lancashire During the Rebellion of 1715. The Chetham Society. Lancaster, J.H.D (2016). Preston: Battlefield visit notes and observations. CastlesFortsBattles.co.uk. Oates, J (2016). 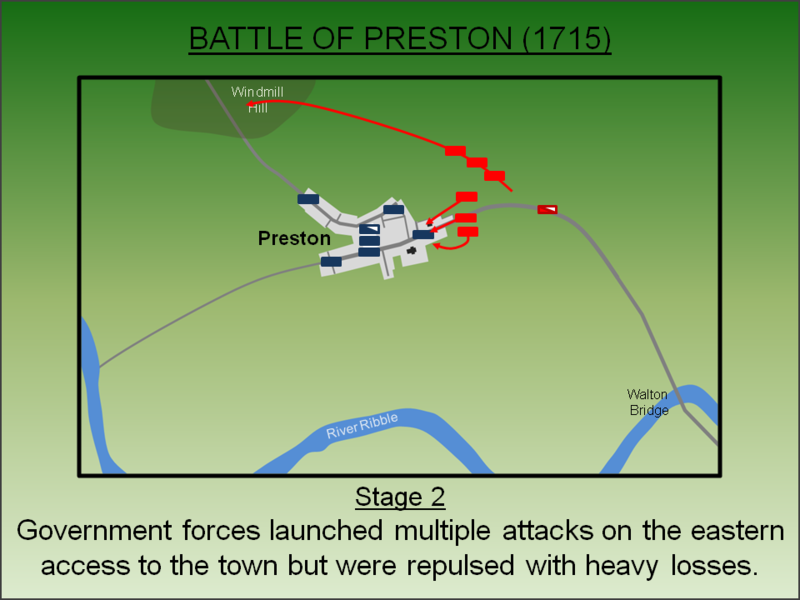 The Last Battle on English Soil, Preston 1715. Routledge, London. Patten, R (1717). The History of the Rebellion in the Year 1715. Szechi, D (2006). 1715: the Great Jacobite Rebellion. New Haven. Vallance, E (2006). The Glorious Revolution: 1688 - Britain's Fight for Liberty. Little Brown, London. 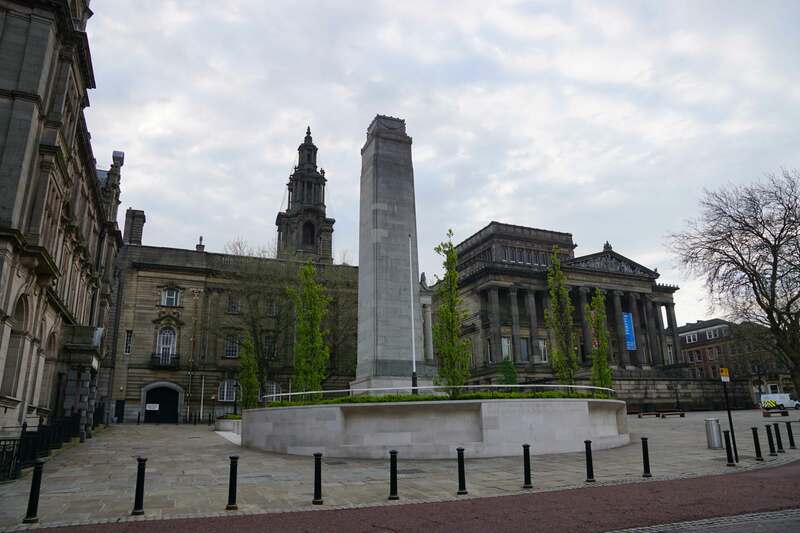 Preston bears no resemblance to its eighteenth century appearance nor is there any monument commemorating the battle. The layout of the roads has survived however enabling the visitor to trace the steps of the battle. Market Square. In 1715 the market square was much smaller and surrounded by timber framed buildings. A Market Cross once stood at the centre. On 10 November 1715 the Jacobites proclaimed James Stuart as King James III here although he was still in exile in France at this time. Harris Building. At the time of the battle the site of the Harris building was occupied by the Mitre Inn which was taken over by the Jacobites and served as Forster's headquarters. The Harris building itself was built in 1882. Contemporary Building. 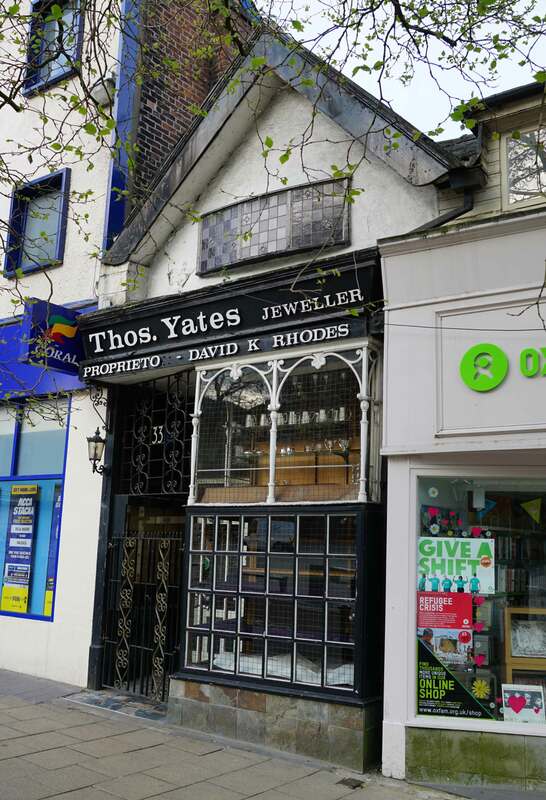 A small timber framed building survives! The entire Market Square was originally surrounded by such structures. Main Sprit Weind. This narrow lane was typical of the narrow streets of 1715. As the Government troops advanced along such bottlenecks, they suffered heavy casualties. Church Street. This was the scene of the fierce fighting on the 12 November 1715 with the Government troops making repeated efforts to storm the barricade. A number of large houses on the outskirts of the town (now gone) were taken and attempts were made to flank around the Jacobite positions. However from the church tower, Forster's men had an excellent view of their enemies' movements and defeated every attempt to break into the town. 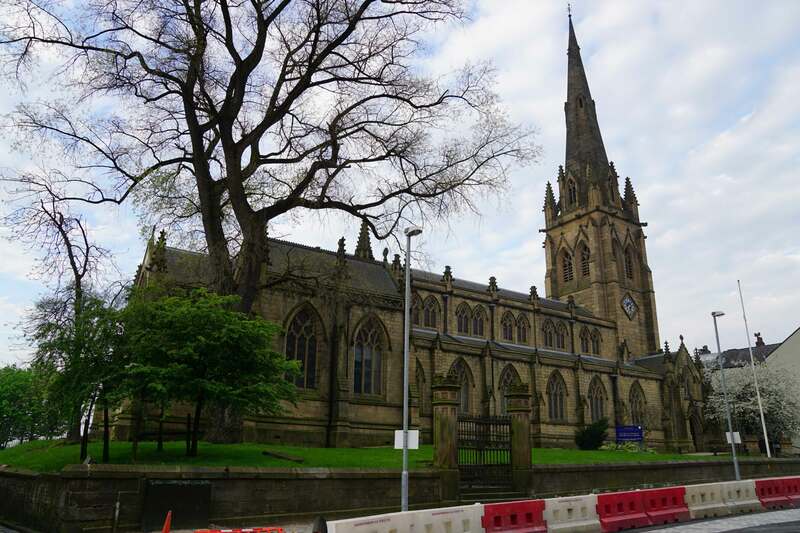 The church seen today dates from 1853 and was a direct replacement for the (modified) Norman church that existed at the time of the battle. Northern Barricade. The northern defences were attacked around sunset (5pm) on 12 November 1715. Today the layout bears no resemblance to that of the battle as this was an area occupied by a windmill and farm buildings. An Alice Bolton later claimed £40 compensation from the Government for burning her barns in this vicinity. Walton Bridge. The Jacobites did not contest the bridge over the River Ribble as they had been surprised by the arrival of the Government forces. Nevertheless General Mills was suspicious and advanced cautiously along the hedge-lined roads towards Preston expecting an ambush. None was planned however as the Jacobites were frantically fortifying the town. 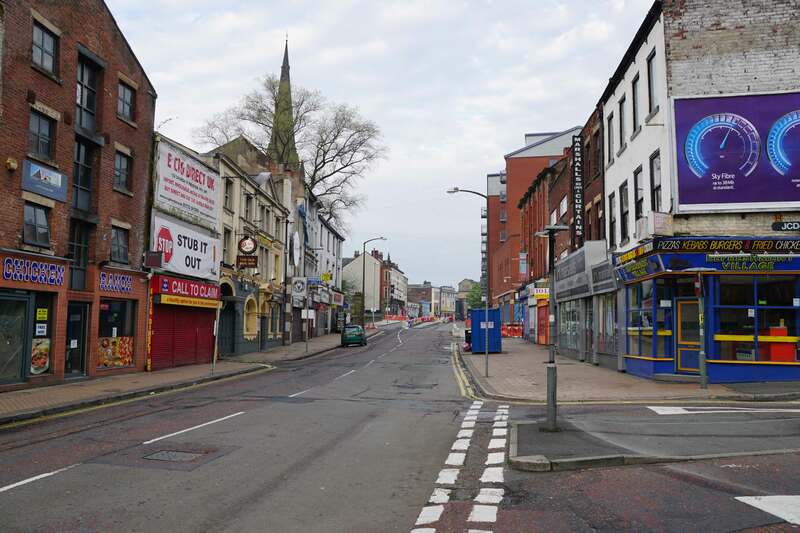 Preston is easily accessible off the M6 motorway. 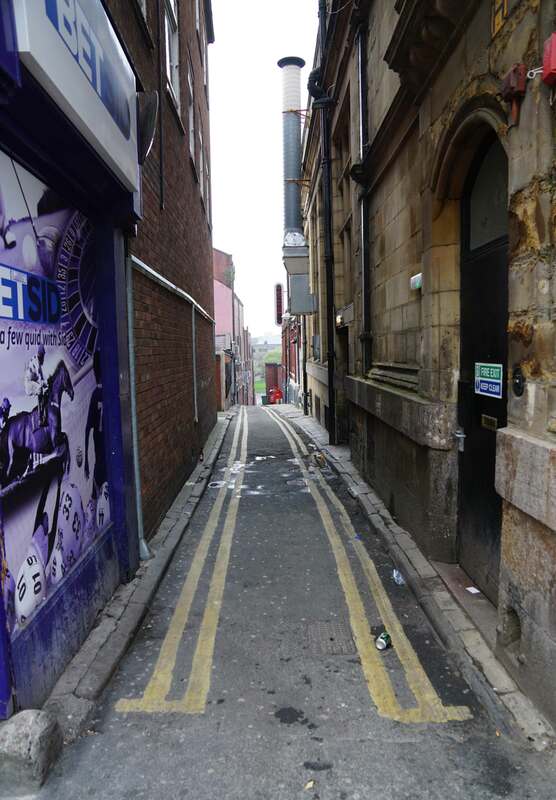 There are ample parking facilities available in the city centre with one option shown below.